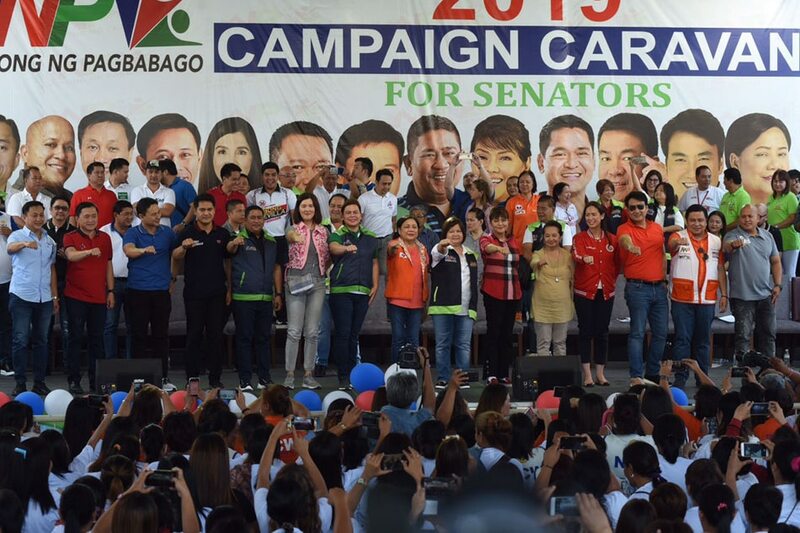 PAMPANGA (UPDATE) - The coalition of senatorial bets under Davao City Mayor Sara Duterte-Carpio’s regional party Hugpong ng Pagbabago kicked off its campaign in vote-rich Pampanga Tuesday morning, the first in over 100 campaign sorties that the ruling coalition hopes to finish in three months. Duterte-Carpio’s HNP is teeming with candidates, fielding one slot more than the usual 12-person slate being fielded by political parties in the past. HNP-endorsed candidates include re-electionists Aquilino “Koko” Pimentel III, Sonny Angara, Cynthia Villar, and JV Ejercito, as well as former senators Pia Cayetano, Jinggoy Estrada, and Bong Revilla, who are hoping to make a comeback in the upper chamber. Completing the HNP slate are President Rodrigo Duterte’s former political adviser Francis Tolentino, Senate race newcomers former Special Assistant to the President Bong Go, former police chief Ronald Dela Rosa, Maguindanao Rep. Zajid Mangudadatu, former journalist Jiggy Manicad, and Ilocos Norte Gov. Imee Marcos. The HNP slate is separate from the leaner team of the ruling Partido Demokratiko Pilipino - Lakad ng Bayan (PDP-Laban), which is fielding Dela Rosa, Go, Mangudadatu, Pimentel and Tolentino. HNP’s campaign kickoff had all the ingredients of a typical sortie - entertainers, campaign jingles, a singing candidate, and T-shirt and other goodies being thrown to an enthusiastic crowd. Almost all the bets told jokes to liven up their speeches and praised the culture of the place they were visiting. Dela Rosa sang “You Are The Reason” by English singer Calum Scott, Marcos made a reference to the “nutribun”, a bread which became popular during the presidency of her late father, dictator Ferdinand Marcos. A launch in Pampanga for the campaign of the administration coalition is significant in many ways. The rich-vote province, which delivered a significant win for the Mindanaoan Duterte in the 2016 polls, is also the bailiwick of former president and now Speaker Gloria Macapagal-Arroyo. Arroyo, who graced the event, appealed to Kapampangans to deliver the Duterte-backed candidates another “landslide” win. “Noong nakaraang halalan, pinakamalaking landslide na nakuha ni Mayor Duterte sa labas ng kanyang balwarte, walang iba kundi sa Pampanga,” Arroyo said. Duterte-Carpio, who has become an influential power broker in the Duterte administration, helped install Arroyo as Speaker, ousting Pantaleon Alvarez. Speaking to reporters, Duterte-Carpio said she was “overwhelmed” by the immense support given by Kapampangans to her regional party. She, however, denied that the the HNP is being groomed as a national party in time for the 2022 presidential elections, even as some political supporters, although in jest, would sometimes refer to her as the next president.